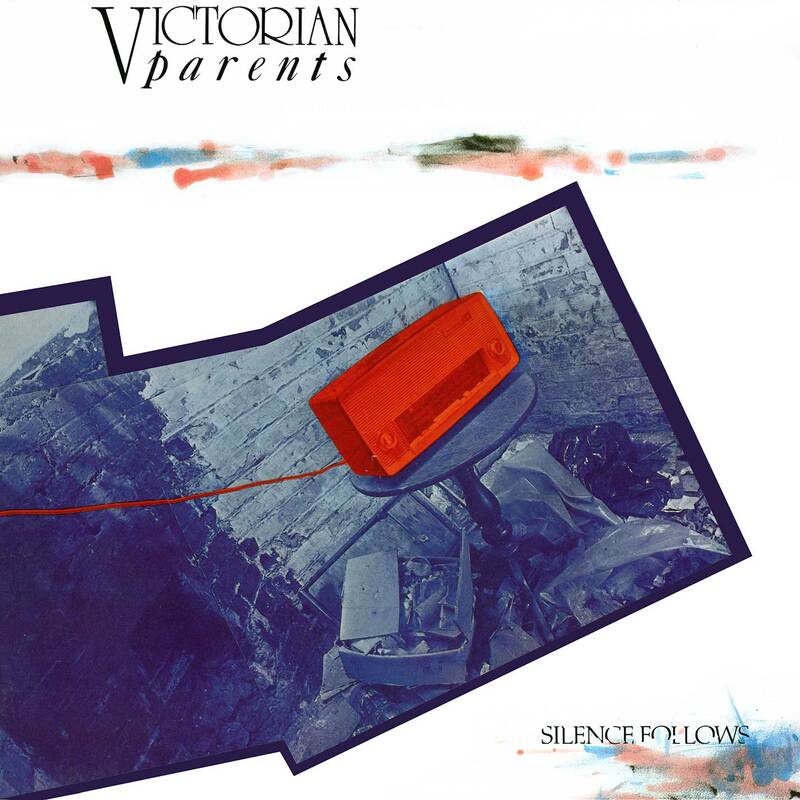 It was early 1982 when, by chance, I first heard of Victoria Parents in an album review in a British periodical. The “periodical” was “SFX #4;” a then innovative fortnightly cassette ‘magazine’ called SFX which was a C-60 that appeared bi-weekly in 1982 for ultimately less than a year. I had to buy this as an import in America, but it was the closest thing to an hour of top quality UK radio available to us Yanks. 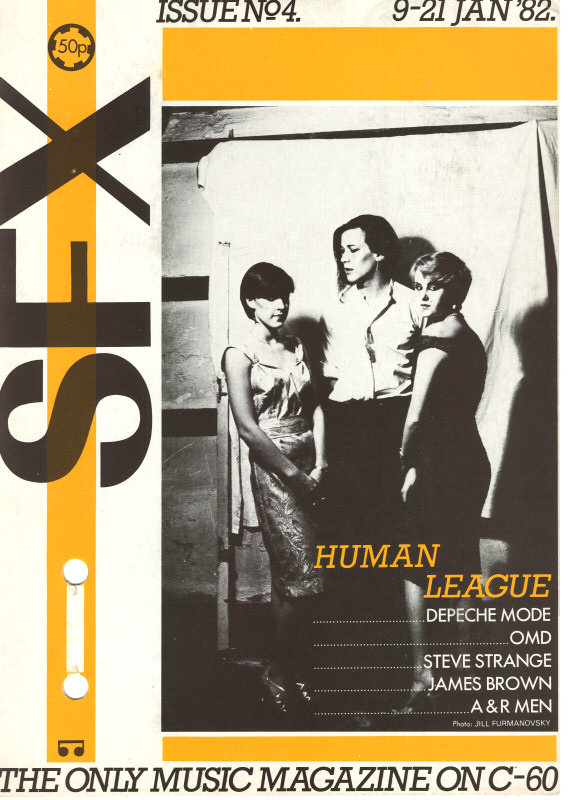 The bands on the “cover” of this issue made this a must buy: The Human League, OMD, Steve Strange. Even those upstart twerps Depeche Mode whose debut album had not convinced could be found on this tape. Best of all, the music reviews went several steps better than what happened in print. Here, you actually got to hear what the writers were talking about… and make up your own mind. It was there that I had my first brush with Victorian Parents. The album was called “Silence Follows” and I was hot to get my hands on a copy. The band were compared to Simple Minds in the article and although my first listen to the group would be happening any day now with the purchase of the 2×7″ of “Sweat In Bullet,” they were still a mysterious touchstone that I had become aware of but had not yet heard. The sounds on the review were very interesting. The reviewers thought that they were trendy for their usage of drum machine, which was all that anyone in the UK was thinking about at this time since the Linn had just hit like a ton of bricks on “Dare” a few weeks earlier. One reviewer [the reviews were round table style] slagged them off by saying that Johnny Rotten would call them “trendy hippies” due to the unfashionable amount of guitar in the band. Unmoved by the reviewers cloth-headed comments, I liked what I had heard excerpts of and kept my eyes open for any records by the band. I think it was sometime in the pre-web years of 1992 when in my usual Vinyl Vendors catalog I finally [finally!] saw a copy of “Silence Follows” for sale! This had been a long, hard slog, so I immediately ordered the record for what seemed to be $12 if I recall correctly. As it was the pre-computer era, I made a cassette of the album and was struck by its ability to follow its own distinct path in a year where there were either leaders, or followers. The album had seemed to be a feast of synths in those brief snatches I’d nursed for so long, but on hearing the entire thing, I realized that the only synths on the album were guitar synths! No keyboards were used in the making of this record! This gave it a very distinct sound that pushed far from the shores of Roland or Casio products, which were beginning to sprout like mushrooms all over the 1982 musical landscape. I also had to laugh at the “drum machine” intro to the song “Self Indulgence” that was referenced on the SFX tape. It was obviously an acoustic kit recorded and treated with a little slapback [among other FX] to achieve the sort of mechanical sounding drums that were very much human-driven ala Bowie’s influential “Low” album. Yet the recording managed to completely avoid the Eventide Harmonizer processed drum sound, that was already by 1981, a ponderous drum cliché. Having finally heard this album after mere glimpses at what it offered for so long, I do have to admit that the critical comparison to Simple Minds held some water. This sounded for all the world like exactly the sort of album that someone who had warmed up to “Sons + Fascination” and “Sister Feelings Call” should have moved on to. It was Post-Punk with a rebellious undercurrent of near-Prog that fully managed to take away only the positive traits from that game board and run far with them. The first [and only] Polydor single began side one. “All American Hero” began with dryly percussive rhythm box abetted with a real kit sparingly used for seasoning. The loping guitar figure that underpinned the intro was memorable and repetitive. When vocalist Steve Johnson began singing he recalled fellow Polydor signee Julian Cope, but the overall vibe of the track was far from that of Teardrop Explodes. This had a strong whiff of Simple Minds at their Krautrock inspired peak issuing from it on playback. One fascinating feature of the song was the Arabic scaled guitar solos that followed the song’s middle eight and featured prominently through the dynamic song’s outro. The juxtaposition of the title with Middle-Eastern inspired sonics was certainly provocative in 1981 [and remains so today, sadly]. “On The Border” was a lusher number, heavy with the guitar synths that typified this record. The undercurrents of heavily effected rhythm guitar doubled for sequencers and synth loops that were completely missing from this album. This was a dynamic look at Post-Punk through a keyboard-free filter that has seen this resulting album nimbly vault the tech-signposts that heavily stamped their footprints in many a 1981 album. The motorik-variant intro to “Self Indulgence” gave the song an immediate appeal that was apparent from the SFX tape, but the cascading guitar riffs that shoot through the song’s landscape speak of an elegance that the lack of keyboards can lead to in the right hands. Great guitar playing will trump clumsy synth playing on most days, as this album capably proves. Side two began with the tense, urgencies of “No Response” and I can only surmise that The Police were listening to this one, since it telegraphed 1983’s “Synchronicity One” in some ways to these ears. Only with better songwriting. I love the inspired segue of this song’s outro with the intro of “Wasteland” crossfading across channels until the booming drums and muscular bass of the latter make the transition fully felt as the stereo spectrum returned to the music. By the time that I discovered the Discogs.com database of recorded phenomena, it became apparent to me that there were singles by Victorian Parents. In short order, I purchased both the indie 7″ of “Dead Red Grass Of Home” and the Polydor single on 7″ of “All-American Hero.” There was no 12″ single and as far as I can tell, I now own the entire Polydor canon. The 7″ of “Dead Red Grass Of Home” contains an earlier version of the song from the “Silence Follows” album and a non-LP B-side; “Another Waste of Time.” Which, as coincidence would have it, was the same B-side on the Polydor single! There were no changes made to the master – the song is exactly the same on both 7″ singles. 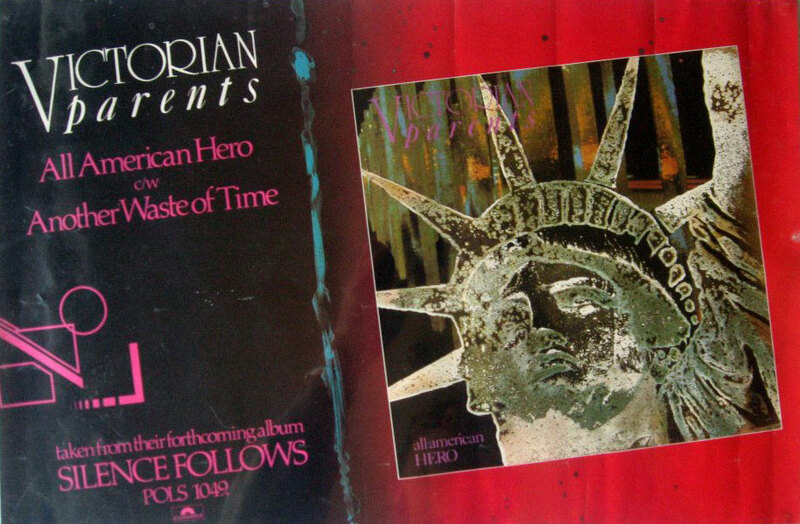 The A-side of “All-American Hero” was also identical to the album version, so technically, having the Polydor single was superfluous when owning the indie single, but the Polydor B-side was in much better condition; making it the target disc to remaster from. 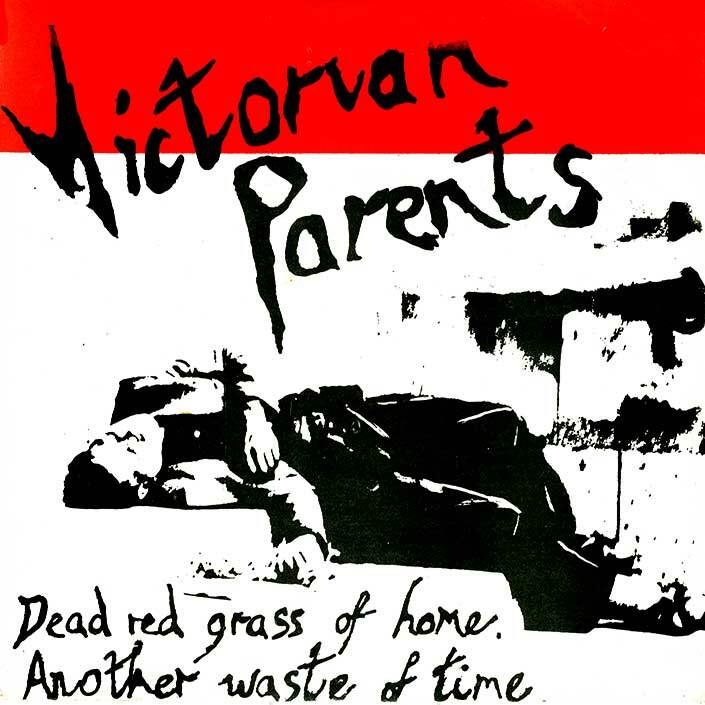 As 1982 came and went, so did Victorian Parents from Polydor. The new corporate regime cleaned house that year and cut the band loose, leaving them to release one further track, “Second Thoughts” on a compilation EP called “Those That Fell” released in 1983 on the Local Records label. This currently evades my reach. It’s out there but is costly. So that track is not accounted for here, much to my chagrin. Also, there is said to exist a cassette single of “Dead Red Grass From Home” with three live in the studio tracks appended to the two from the 7″. “Infamy,” “Arnold’s Dream,” and “Proper Gander” remain unheard, and given that they were recorded on an indie cassette 34 years ago, I’m not holding out much hope of finding and remastering these. For me, the tale endeth here. This entry was posted in Remastering and tagged 1981, Polydor, SFX, Victorian Parents. Bookmark the permalink. I must confess I have never heard of this band! I vaguely remember SFX but didn’t buy it at the time.There was another similar music mag at that time but with a vinyl LP and large booklet whose name escapes me. It sounds intriguing,I am a fan of guitar synths,with the two Fripp/Summers albums from the 80s being great early exponents of the technology. Gavin – You are talking about “Debut” which was an LP + gatefold magazine format. I have several issues of that one. The Ultravox and Stranglers covers. Later issues downsized to a 10″ format and it lasted about as long as SFX; 12-18 months. Both were time capsules of a kind to be treasured. You may enjoy Victorian Parents. Keep an eye out. Another band I missed but that sounds right up my street. Funny to think what major labels released in those halcyon days!